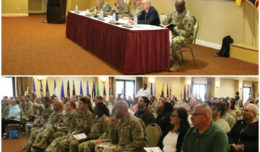 The Fort Irwin Tax Center ribbon cutting ceremony is conducted by National Training Center Commander Maj. Gen. Ted Martin (left, center), Command Sgt. 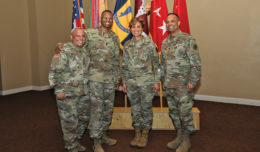 Maj. Stephen Travers (center), Staff Sgt. Jesse Cuellar (right, center) and Capt. Tristan DeVega (right). Inside the tax center entrance (from left) are tax preparers Pfc. Duncan Kaplan, Spc. Alexis Kenley and Spc. Behnam Ghandhari. Cuellar is non-commissioned officer in charge of the center and DeVega the officer in charge. 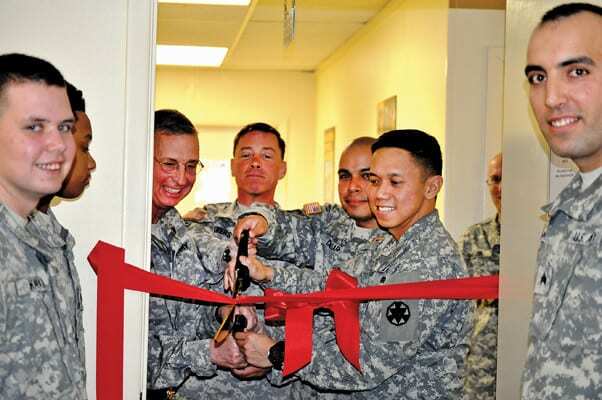 Fort Irwin’s Tax Center opened Jan. 20 with a ribbon cutting ceremony by National Training Center Commander Maj. Gen. Ted Martin and Command Sgt. Maj. Stephen Travers. The tax center offers free tax preparation services by tax preparers certified by the Internal Revenue Service and the California Franchise Tax Board. The center is located at building 230 and open weekdays from 9 a.m. to 4 p.m. The tax center takes walk-in customers, but highly encourages appointments to be made by calling 380-3604. Eligible clients: active duty Soldiers and their dependents, military retirees and their dependents, and Reserve/National Guard Soldiers on orders for 30 days or more. 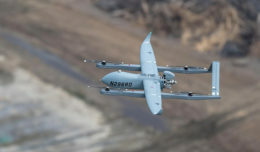 Documents required: military identification card, Social Security card, W-2, 1099-R, 10-99INT, or other tax documents regarding income and expenses and last year’s tax return.